I love using a setting spray on a daily basis. I find that not only does it help set my makeup and keep it in place, it also takes away that powdery look that can cause makeup to look cakey. I am forever looking for a cheaper alternative to the Urban Decay or Skindinavia setting sprays, so when I saw that Maybelline had released a setting spray I picked up a bottle to try. 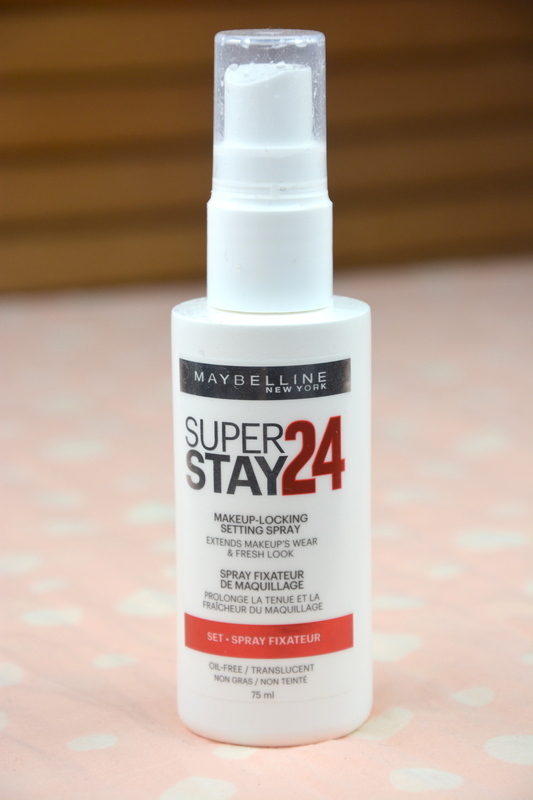 The Maybelline Super Stay 24h Makeup-Locking Setting Spray claims to extend the longevity of makeup and keep it looking fresh throughout the day. When I first sprayed it I found out quickly that the spray was vicious! I ended up with a soaked face so had to quickly fan my face dry before my makeup ran everywhere. The other thing I noticed was that when the spray dried I ended up with white dots all over my face. I thought maybe that I had not shook the bottle enough before spraying it on my face, so the next time I used it I made sure to shake the bottle well, however the same thing happened to me again. I had no idea why this was happening so decided to spray it away from my face first and then spray it on my face, this time there were no white dots. Doing this was the only way to avoid ending up looking like I had paint all over my face, which led me to waste a lot of product in the process. Once I had established how to use the product without soaking my face or ending up with white dots on my face I was pretty pleased with the results. The setting spray took away the powdery look from my makeup and did help to keep my makeup in place for most of the day but not as well as my Skindinavia one does. I do not like being so negative about a product but I am really disappointed in this setting spray from Maybelline. It takes far too much effort and uses way too much product to get it to work well. This is not something I would recommend or purchase again. My search for a good drugstore setting spray continues. I have this exact same problem! Even after spraying it away from my then onto my face it still dried white. Never in my life have I brought a spray before. Trying out new things and the make-up world so I was shocked when I saw the white marks! Any recommendations of a similar price range would be much appreciated! Hi Victoria. The L’Oreal one is much better. Just give it a good shake first and it works really well.